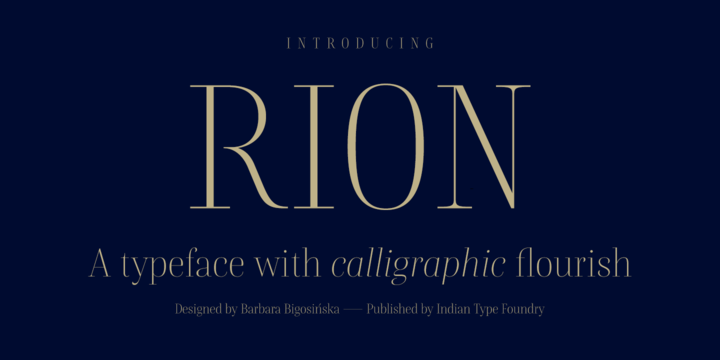 Rion is a calligraphic typeface created by Barbara Bigosinska and published by Indian Type Foundry which is available in 12 styles, 6 weights (from XLight to Black) and italics, a wide range of OpenType features (Capitals are slightly shortter than ascenders, Narrow body proportions, extremely high contrast, extra thin terminals, default numerals are proportional oldstyle etc.) and language support. This nineteenth century font with hight-contrast is suitable for typographic use, editorial, magazine, signage etc. Have fun! Styles: XLight, Light, Regular, Medium, Bold, Black, Italics. Price: starting from $50 for one font to $350 for all 12 fonts. A font description published on Friday, May 25th, 2018 in Barbara Bigosinska, Fonts, Indian Type Foundry by Alexandra that has 2,424 views.